For today�s Adventures in Obscure 80s Horror, we head to 1982�s Superstition. This one takes us to a property with a difficult history. Teens use the house to stage �haunted� pranks, and they also skinny-dip in its pond. Some of these incidents end with deaths, a factor that concerns the local authorities. Despite these issues, Reverend George Leahy (Larry Pennell) and his family move into the house. More mayhem occurs, and the team of young Reverend David Thompson (James Houghton) and crusty police detective Sturgess (Albert Salmi) investigate. Superstition might boast the copyright date of 1982, but the movie essentially sat on the shelf until 1985. Maybe someone can find a good film that got held back for years, but it�s hard to imagine. Still, I try to watch with an open mind. Perhaps Superstition would overcome its problematic history and bring a bracing tale. Or perhaps not! Another example of cheap, uninspired 1980s horror, Superstition lacks any kind of real cinematic value. Everything about the movie seems cheap and poorly executed. Effects come with bargain basement price tags attached and never remotely feel convincing, a major issue in a movie like this. Face it: 80s genre fans like their blood and gore, so if those elements don�t work, the films lose a lot of appeal. While I don�t expect totally believable effects from a 1982 horror flick, I�d like something more realistic than the cheesy material on display here. Even beyond the lousy effects, Superstition suffers from a tremendous lack of creativity. It borrows from a slew of other movies � and by �borrows�, I mean it steals relentlessly. It doesn�t take a genre fanatic to recognize the �influences�. 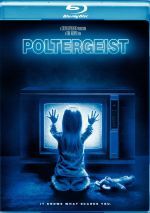 Even casual fans can recognize the connections, as we get clear signs of Halloween, Exorcist, Friday the 13th, Amityville Horror, Poltergeist and probably a dozen more. Ignore the thievery and you still wind up with a slow, spotty film, one tremendously light on scares or surprises. Stuck with amateurish production values, mediocre acting and a total absence of actual horror, Superstition fizzles. Superstition appears in an aspect ratio of approximately 1.85:1 on this Blu-ray Disc. This was an erratic but acceptable image. For the most part, sharpness looked fine. A little softness cropped up on occasion, and I couldn�t call the film razor-sharp, but it showed pretty positive delineation the majority of the time. No issues with jaggies or shimmering materialized, and I saw no signs of edge haloes. Print flaws became the biggest problem with the image, mainly due to small specks as well as some nicks and vertical lines. These weren�t a constant distraction, but they cropped up more often than I�d like. In terms of colors, the film opted for a natural palette. Overall, the hues seemed appealing, so while they didn�t leap off the screen, they showed reasonable pep and clarity. Blacks were fairly dark and tight, and low-light shots offered decent smoothness. Though the image could�ve been cleaner and tighter, it still offered decent visuals. As for the film�s DTS-HD MA monaural soundtrack, it seemed fine for its age. Speech showed occasional edginess � usually during screams - but the lines remained intelligible and were usually reasonably natural. Music was pretty full and rich, whereas effects seemed decent. Those elements lacked much punch but they didn�t display notable problems. This was a largely average track given its era. Only a few extras appear here, and we find an interview with actor James Houghton. In this 30-minute, eight-second piece, Houghton discusses his life and career, with an emphasis on Superstition. Houghton proves likable and engaging as he goes through various memories. In addition to a trailer and a TV spot, the set brings an interview with director James Roberson. During this 23-minute, 56-second program, Roberson covers various dimensions of his time in showbiz as well as his work on Superstition. Like Houghton�s piece, this ends up as a worthwhile discussion.